For-sale housing inventory fell to a decade low during August, and limited housing stock along with strong demand for homes are beginning to encourage home builders to shift their focus from larger, luxury homes to smaller, entry-level housing. This change could provide some relief to the supply-constrained housing market, though a larger impact will likely not be realized until the spring. Through the remainder of this year, newly formed households will likely continue to favor rentals, sustaining steady demand for the record number of apartments scheduled for delivery in 2016. New-home builders focused on larger, luxury homes since the recession as buy ers of these homes faced fewer credit restraints and remained active in the market while first-time homebuyer activity weakened. As a result, a shortage of smaller, entry-level homes typically targeted by first-time homebuyers weighed on the market. 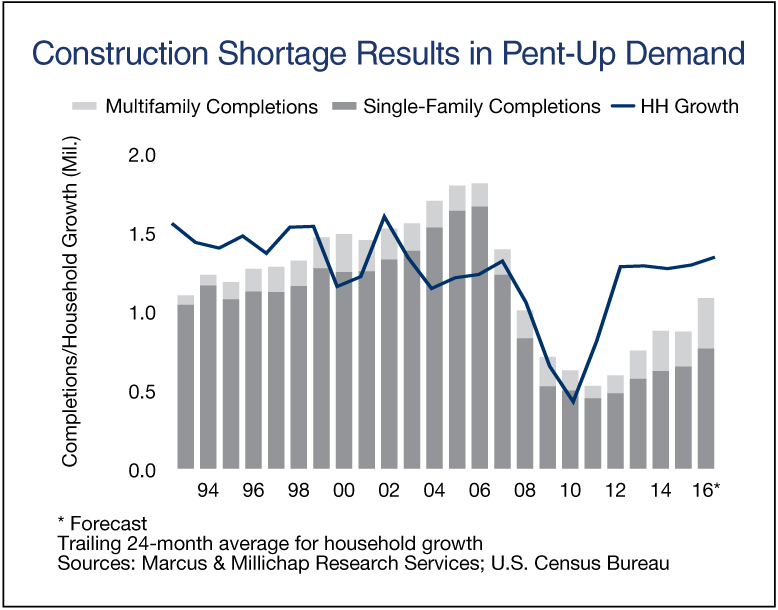 Builder sentiment, however, has begun to shift as they seek to capitalize on rising demand for single-family housing. Builders are beginning to construct more smaller homes with lower price points and geared toward the entry-level buyer. In the second quarter, the median square footage of a newly constructed single-family home declined by 70 square feet from the median of homes built in the first quarter, while sales of new homes in the $200,000 range strengthened. Despite healthy job creation and low interest rates, sales of existing single-family homes have failed to advance as inventory constraints and high prices keep many would-be buyers from purchasing homes. In recent months, sales activity has flattened but remains above the long-term average, and the supply of existing single-family homes for sale fell to 4.2 months in August, the lowest level since mid-2005. Rising prices have been driven by this shortage of listings and healthy demand, with the median advancing more than 4 percent above the prerecession peak to $240,200 during the month. Mortgage applications are up more than 25 percent from one year ago, but applications for home purchases have only increased 10 percent during the span. Low interest rates and rising home values are driving significant refinancing activity, leaving some homeowners with more disposable income for home improvement projects. As a result, sales at home improvement stores have increased 2.2 percent over the last year, fostering healthy retailer expansion. This year, retail vacancy will fall to 5.6 percent, the lowest level this business cycle. This entry was written by marcusmillichap, posted on October 26, 2016 at 11:49 pm, filed under Uncategorized and tagged Economy, Housing, Marcus and Millichap. Bookmark the permalink. Follow any comments here with the RSS feed for this post. Both comments and trackbacks are currently closed.